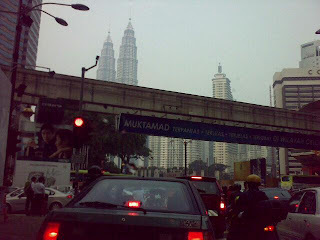 Me and hubby have been wondering what's up here in Kuala Lumpur. Ever since we got back from Thailand we noticed the super hazy skyline of K.L. We tried to check if this is because of the Indonesian forest fires but it's not. The news simply states that it's bec of the humidity and the hot weather which we have been experiencing these past weeks. On the same note, about the environment... Me and hubby watched a film which was a hit in Europe and was shown only days ago ... It's called ' Home ' . It was a beautifully done film about the environment and how we should cherish the resources we have today. Years from now we may face depletion of key resources like oil. I encourage everyone to check out this film as it's really a wake up call for all of us! We all need to do our share for the environment.